MONTEBELLO – Montebello Unified’s Bell Gardens High School has been revalidated by AVID (Advancement Via Individual Determination) as a National Demonstration School, which recognizes schools that have successfully implemented the AVID College Readiness System as models for other schools. AVID was brought to BGHS in 1998 and served 32 students. The school was first deemed a National Demonstration School in 2004 and now serves about 600 students annually. BGHS has a 100 percent AVID graduation rate, conferring diplomas to all 112 AVID seniors in the Class of 2016. The AVID system has impacted the entire student population at BGHS by creating a college-going culture supported by schoolwide AVID instructional strategies and practices. AVID is implemented in more than 5,600 schools throughout the United States. 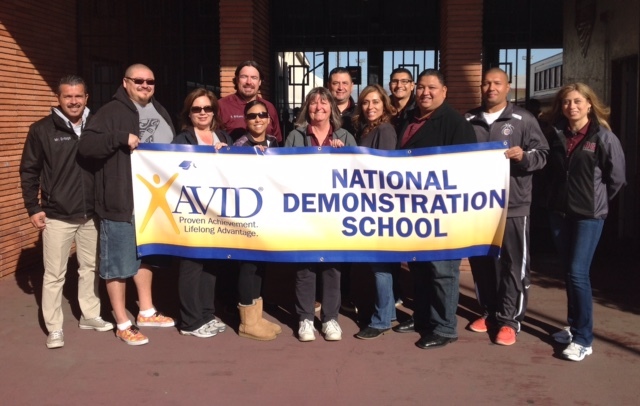 BGHS, revalidated after an application process, screening, review and site visit, joins 157 AVID National Demonstration Schools in the country and is one of only five schools in Los Angeles County to hold the distinction. AVID is a nonprofit organization that provides educators with proven, real-world strategies to accelerate the performance of all students so they can succeed in college, career and life. 120816_MUSD_AVID: Bell Gardens High School Principal Juan Herrera (third from right) stands with BGHS AVID teachers as they hold a banner celebrating the school’s revalidation as an AVID National Demonstration School.